Less than 48 hours had passed after the latest agreement between the Houthi rebel movement and the Yemeni government, and the ground had shifted once again. The resignations of President Abdrabbuh Mansour Hadi, newly-appointed Prime Minister Khaled Bahah, and the entire cabinet were quickly followed by reports that the parliament had rejected their requests. Given Yemen's mercurial political playing field, another new configuration could be just around the corner. 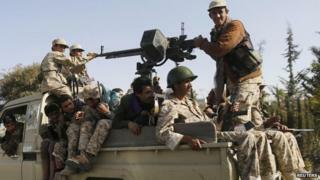 The tension from four days of fighting and negotiation between the rebels and Yemeni security forces seemed to have reached a resting point, with President Hadi and Houthi leaders reaching an agreement on Wednesday. That agreement essentially saw Mr Hadi capitulate to rebels' demands in exchange for a ceasefire, release of a kidnapped presidential adviser, and the withdrawal of rebel forces from some key positions in Sanaa. Yet a day later, the presidential adviser had not been released and rebels still surrounded the presidential palace and Mr Hadi's private residence. Judging from their mass resignation, Mr Hadi and his government decided that operating under the rebels' thumb was untenable and found little reason to believe the Houthis would ever fulfil their end of the bargain. Either they have given up entirely, or they are now playing their strongest card. The Zaidi Shia movement, whose traditional stronghold is the northern province of Saada, led massive anti-government rallies over the summer and then suddenly infiltrated the capital with its heavily-armed militia and tribal supporters, taking de-facto control Sanaa by mid-September. The government, political parties, and the Houthi movement signed the Peace and National Partnership Agreement (PNPA) on 21 September, but it has largely gone unimplemented. Over the past year, Houthi leaders rightly concluded that they can use military might to change the political map and balance of power in their favour. The true extent of Houthi ambition is unclear; but the fact that they did not kick Mr Hadi out of the presidency or claim the premiership indicates they prefer to control from behind the scenes by placing their members in ministries and high-level government positions. This allows them to consolidate power, but without being saddled with ultimate responsibility. But the resignations of Mr Hadi and Mr Bahah now turn the table on their strategy. Sadly, the rebels' tactics affirm the power of the gun over the power of persuasion, and it marks a massive setback for the democratic transition process that began in 2011 with a youth-led uprising against longtime President Ali Abdullah Saleh, a new government, and a successful National Dialogue Conference that produced agreement on the country's most pressing problems. The Houthis were included in the 10-month national dialogue process, and their representatives actually participated quite constructively in the working groups. But they were ultimately unhappy with the agreement of a six-state federal system they perceived would erode their power and autonomy. Since they did not win that fight politically, Houthi fighters set out to change the facts on the ground. They systematically pushed into new territory, aggressively picking fights with tribal militia, government forces, and al-Qaeda in the Arabian Peninsula (AQAP) militants, and established some degree of control in at least nine of Yemen's 22 provinces. The latest conflagration in Sanaa was prompted by the newly-drafted constitution, written by a 17-member committee including a Houthi representative, which established a framework for the federal system that the Houthis vehemently oppose. In his widely-watched speech on Tuesday, the movement's leader Abdul Malik al-Houthi outlined his demands, including revision of the new constitution and full implementation of September's peace deal, and advised the president to "stop delaying and being stubborn". But it is difficult to take Abdul Malik al-Houthi at face value since the Houthis themselves have not implemented the most critical component - withdrawal of their forces and demilitarisation. Waving the fig leaf is a rhetorical flourish, but his anti-corruption message certainly resonates and may gain supporters among average Yemenis. If the president and his prime minister are convinced to return and survive politically, they will emerge a far weaker and less empowered duo. Mr Hadi's inability to stem the Houthi aggression over the past five months had already eroded his quickly evaporating credibility and public support, but this latest action might just be the end of this charade. When the Houthis forced a change in government and prime minister last year, there was some hope that a competent technocrat like Mr Bahah - a massive improvement over his predecessor - would manage to provide some leadership and momentum for the new government to fulfil its promises. But the internal tribal divisions, meddling by the former president, threats from AQAP, and the Saudi-Iranian proxy war have proved too much for Mr Hadi and Mr Bahah to handle. For the United States and its allies, the recent events and ascendency of the Houthis are deeply troubling. The fact that President Hadi can control or claim loyalty from very little of Yemen's military is indeed worrisome, and AQAP is already capitalizing on the distraction, chaos, and unaddressed grievances in tribal areas to wreak havoc and grow its ranks. Saudi Arabia has halted its financial support, refusing to bank-roll a country dominating by an Iranian-supported, Shia-affiliated group, and this could lead to an absolute economic collapse with salaries unpaid and currency scarce. President Hadi has been a loyal and consistent ally in the US counterterrorism campaign - far better than his predecessor - but he is now fighting for his very survival. If the Houthis are now the real power brokers, the US will have few allies to rely on for security co-operation, fewer intelligence assets, and fierce resistance to US drone strikes on Yemeni soil. At present, the Houthis are sailing high - riding on their alliance with Mr Saleh and his loyalists in the military and their alleged financial and ideological backing from Iran. President Hadi might be able to prompt a public outcry for his return, but that would be a far stretch for someone who lacks broad support. This may not qualify technically as a coup, but the result may be the same, and the Houthis are unlikely to stop until they have full control, at least over the north of the country. And unless external events shift the course, or alliances erode, we should expect to see Houthis calling the shots for some time to come.